Can my horse get its head or foot stuck? Our own horses have used Hay Hutch since 2007. We have had no problems. The plastic is flexible. It is important to ensure that any fixing bolts do not become loose. Do not leave empty Hay Hutch in the field for long periods. If it is used as a toy, problems may occur. Can my horse reach inside to eat all of the hay? Yes. 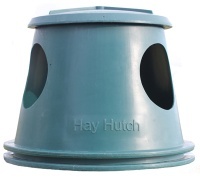 There are three feed apertures in the Small and Medium Hay Hutch and six in the Large Hay Hutch. If horses have access to all of the apertures, they can eat all of the hay. How much hay can you put into the Hay Hutch? Glossary. Small bale is a small traditional bale. Low density fodder is loose haylage or hay from a small traditional bale or an unwrapped round bale. High density fodder is compact haylage or hay from a "quadrant" big bale. My horse can be playful. Can he get the lid off? 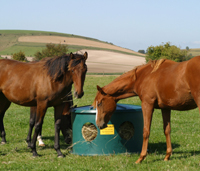 If your horse learns how to rotate the lid to remove it, use the special locking bolt supplied. Is all hay wastage prevented? 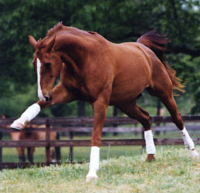 It is possible that some horses will pull hay out and put it onto the ground. 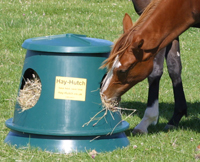 However, a Hay Hutch is a significant improvement over any alternative method and minimises hay wastage. 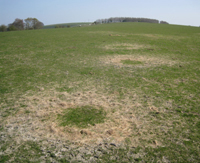 The picture shows one of our fields after using Hay Hutch. There is not very much hay spilled. Toppling. My horse tips the Hay Hutch over. What can I do? 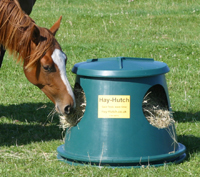 Hay Hutch is designed to be stable in most conditions However, some horses learn to tip them over. 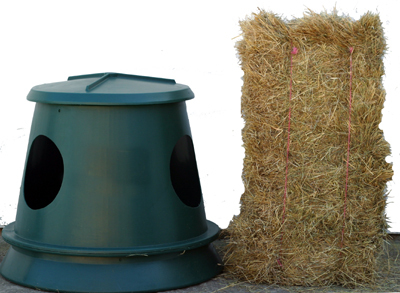 A quick and easy method to increase stability is to put a paving stone or a sandbag inside the Hay Hutch. This may solve the problem. In extreme cases, try this. Buy a large rubber mat, four M6 bolts and nuts (M6 20mm) and eight flat washers. Remove the Hay Hutch lid. Turn it upside down. Place the mat on top. Drill four holes through the mat and the floor of the Hay Hutch. After drilling each hole, insert a bolt with a flat washer. Then apply another flat washer and then the nut. To see a short video, click HERE. Water. A small amount of water sometimes accumulates in the Hay Hutch. This may be caused by severe rain or condensation. 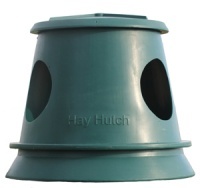 If this is a problem, drill one or two holes in the floor of the Hay Hutch to allow the water to drain. This will not affect the strength of the Hay Hutch. to reach into the middle. This is a possible alternative. Buy large square bales. They are more compact, are better value and often contain better hay. Here is our technique. Use six pallets to make a platform. Get a big bale delivered and placed onto the platform. Slices can be transported to your Hay Hutch using a wheelbarrow or truck. 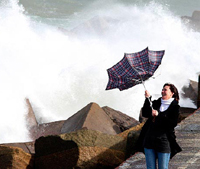 Is strong wind a problem? 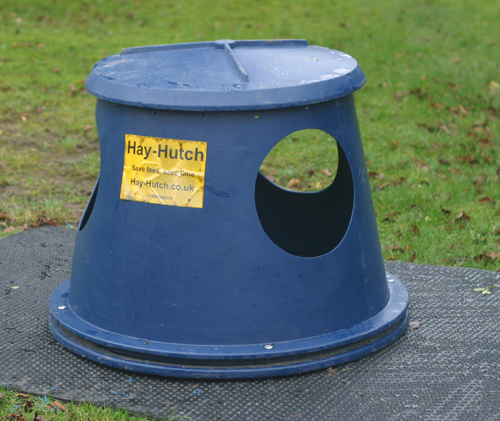 The shape of the Small and Medium is designed to minimise the effects of strong wind. If extreme wind is anticipated, simply put a sandbag or a large block in the bottom. What if horses do not want to share? If one of your horses is a bully, make sure your Hay-Hutch is always contains plenty of hay. When horses know that good, dry hay is always available, they become more content and less likely to fight over it. When will the Hay Hutch be delivered? UK and Ireland: Approximately 3-10 business days. Europe: Approximately 7 - 15 business days. How is the cost justified? Manufacturing large items using high quality polymer is a slow and complex procedure. The finished product needs to be strong enough to withstand a kick from a horse, light enough for it to be possible to pick up or drag along, waterproof and made of material which will not rust or degrade. The manufacturing technique is called rotational moulding. It is skilled, manually intensive, hot and arduous work. The technique is used for containers where strength and durability are critical - commercial fuel tanks, central heating oil tanks, nuclear waste containers, salt/grit bins and motorway crash barricades. a) A special, sectional mould must be made to manufacture each Hay Hutch size. These moulds are very expensive to design and manufacture. b) Each Hay-Hutch is individually made. A team assembles the mould and fills it with the correct quantity of polyethylene powder. The polythene is a high quality, precisely manufactured petroleum product. c) The mould containing the polyethylene is attached to a special rotating frame. The rotating frame carries the mould into a very large oven. The polythene powder melts and spreads round the inside of the mould. d) When the polyethylene has spread throughout the mould, the rotating frame carries the mould out of the oven. The frame continues to rotate whilst the polythene cools and becomes solid. e) The mould is removed from the frame and dismantled. At this time, the Hay Hutch has no apertures and the lid and the body are not separated. f) Whilst the new Hay Hutch is still warm, the feed apertures are cut and the lid cut away from the body. g) It takes approximately one hour to make each Hay-Hutch. The workforce require specialised skills. The cost of the energy to heat the ovens and the cost of skilled manual labour are significant. h) The result of this process is a robust, light and safe container that could not be produced at this quality any other way.